Whether your are a long standing forum member or whether you have just registered today, it's a good idea to read and review the rules below so that you have a very good idea of what to expect when you come to Pacers Digest. A quick note to new members: Your posts will not immediately show up when you make them. An administrator has to approve at least your first post before the forum software will later upgrade your account to the status of a fully-registered member. This usually happens within a couple of hours or so after your post(s) is/are approved, so you may need to be a little patient at first. Why do we do this? So that it's more difficult for spammers (be they human or robot) to post, and so users who are banned cannot immediately re-register and start dousing people with verbal flames. Below are the rules of Pacers Digest. After you have read them, you will have a very good sense of where we are coming from, what we expect, what we don't want to see, and how we react to things. "Anyone who __________ is a liar / a fool / an idiot / a blind homer / has their head buried in the sand / a blind hater / doesn't know basketball / doesn't watch the games"
"People with intelligence will agree with me when I say that __________"
"Only stupid people think / believe / do ___________"
"I can't wait to hear something from PosterX when he/she sees that **insert a given incident or current event that will have probably upset or disappointed PosterX here**"
"This thread is stupid / worthless / embarrassing"
"I'm going to take a moment to point and / laugh at PosterX / GroupOfPeopleY who thought / believed *insert though/belief here*"
"Remember when PosterX said OldCommentY that no longer looks good? " In general, if a comment goes from purely on topic to something 'ad hominem' (personal jabs, personal shots, attacks, flames, however you want to call it, towards a person, or a group of people, or a given city/state/country of people), those are most likely going to be found intolerable. We also dissuade passive aggressive behavior. This can be various things, but common examples include statements that are basically meant to imply someone is either stupid or otherwise incapable of holding a rational conversation. This can include (but is not limited to) laughing at someone's conclusions rather than offering an honest rebuttal, asking people what game they were watching, or another common problem is Poster X will say "that player isn't that bad" and then Poster Y will say something akin to "LOL you think that player is good". We're not going to tolerate those kinds of comments out of respect for the community at large and for the sake of trying to just have an honest conversation. Now, does the above cover absolutely every single kind of distraction that is unwanted? Probably not, but you should by now have a good idea of the general types of things we will be discouraging. The above examples are meant to give you a good feel for / idea of what we're looking for. If something new or different than the above happens to come along and results in the same problem (that being, any other attitude or behavior that ultimately distracts from actually just discussing the topic at hand, or that is otherwise disrespectful to other posters), we can and we will take action to curb this as well, so please don't take this to mean that if you managed to technically avoid saying something exactly like one of the above examples that you are then somehow off the hook. That all having been said, our goal is to do so in a generally kind and respectful way, and that doesn't mean the moment we see something we don't like that somebody is going to be suspended or banned, either. It just means that at the very least we will probably say something about it, quite possibly snipping out the distracting parts of the post in question while leaving alone the parts that are actually just discussing the topics, and in the event of a repeating or excessive problem, then we will start issuing infractions to try to further discourage further repeat problems, and if it just never seems to improve, then finally suspensions or bans will come into play. We would prefer it never went that far, and most of the time for most of our posters, it won't ever have to. A slip up every once and a while is pretty normal, but, again, when it becomes repetitive or excessive, something will be done. Something occasional is probably going to be let go (within reason), but when it starts to become habitual or otherwise a pattern, odds are very good that we will step in. There's always a small minority that like to push people's buttons and/or test their own boundaries with regards to the administrators, and in the case of someone acting like that, please be aware that this is not a court of law, but a private website run by people who are simply trying to do the right thing as they see it. If we feel that you are a special case that needs to be dealt with in an exceptional way because your behavior isn't explicitly mirroring one of our above examples of what we generally discourage, we can and we will take atypical action to prevent this from continuing if you are not cooperative with us. Also please be aware that you will not be given a pass simply by claiming that you were 'only joking,' because quite honestly, when someone really is just joking, for one thing most people tend to pick up on the joke, including the person or group that is the target of the joke, and for another thing, in the event where an honest joke gets taken seriously and it upsets or angers someone, the person who is truly 'only joking' will quite commonly go out of his / her way to apologize and will try to mend fences. People who are dishonest about their statements being 'jokes' do not do so, and in turn that becomes a clear sign of what is really going on. It's nothing new. In any case, quite frankly, the overall quality and health of the entire forum's community is more important than any one troublesome user will ever be, regardless of exactly how a problem is exhibiting itself, and if it comes down to us having to make a choice between you versus the greater health and happiness of the entire community, the community of this forum will win every time. Lastly, there are also some posters, who are generally great contributors and do not otherwise cause any problems, who sometimes feel it's their place to provoke or to otherwise 'mess with' that small minority of people described in the last paragraph, and while we possibly might understand why you might feel you WANT to do something like that, the truth is we can't actually tolerate that kind of behavior from you any more than we can tolerate the behavior from them. So if we feel that you are trying to provoke those other posters into doing or saying something that will get themselves into trouble, then we will start to view you as a problem as well, because of the same reason as before: The overall health of the forum comes first, and trying to stir the pot with someone like that doesn't help, it just makes it worse. Some will simply disagree with this philosophy, but if so, then so be it because ultimately we have to do what we think is best so long as it's up to us. If you see a problem that we haven't addressed, the best and most appropriate course for a forum member to take here is to look over to the left of the post in question. See underneath that poster's name, avatar, and other info, down where there's a little triangle with an exclamation point (!) in it? Click that. That allows you to report the post to the admins so we can definitely notice it and give it a look to see what we feel we should do about it. Beyond that, obviously it's human nature sometimes to want to speak up to the poster in question who has bothered you, but we would ask that you try to refrain from doing so because quite often what happens is two or more posters all start going back and forth about the original offending post, and suddenly the entire thread is off topic or otherwise derailed. So while the urge to police it yourself is understandable, it's best to just report it to us and let us handle it. Thank you! All of the above is going to be subject to a case by case basis, but generally and broadly speaking, this should give everyone a pretty good idea of how things will typically / most often be handled. If the actions of an administrator inspire you to make a comment, criticism, or express a concern about it, there is a wrong place and a couple of right places to do so. The wrong place is to do so in the original thread in which the administrator took action. For example, if a post gets an infraction, or a post gets deleted, or a comment within a larger post gets clipped out, in a thread discussing Paul George, the wrong thing to do is to distract from the discussion of Paul George by adding your off topic thoughts on what the administrator did. A) Start a thread about the specific incident you want to talk about on the Feedback board. This way you are able to express yourself in an area that doesn't throw another thread off topic, and this way others can add their two cents as well if they wish, and additionally if there's something that needs to be said by the administrators, that is where they will respond to it. B) Send a private message to the administrators, and they can respond to you that way. If this is done the wrong way, those comments will be deleted, and if it's a repeating problem then it may also receive an infraction as well. If a poster is bothering you, and an administrator has not or will not deal with that poster to the extent that you would prefer, you have a powerful tool at your disposal, one that has recently been upgraded and is now better than ever: The ability to ignore a user. A) Any post they make will be completely invisible as you scroll through a thread. B) The new addition to this feature: If someone QUOTES a user you are ignoring, you do not have to read who it was, or what that poster said, unless you go out of your way to click on a link to find out who it is and what they said. To utilize this feature, from any page on Pacers Digest, scroll to the top of the page, look to the top right where it says 'Settings' and click that. From the settings page, look to the left side of the page where it says 'My Settings', and look down from there until you see 'Edit Ignore List' and click that. From here, it will say 'Add a Member to Your List...' Beneath that, click in the text box to the right of 'User Name', type in or copy & paste the username of the poster you are ignoring, and once their name is in the box, look over to the far right and click the 'Okay' button. All done! Regarding infractions, currently they carry a value of one point each, and that point will expire in 31 days. If at any point a poster is carrying three points at the same time, that poster will be suspended until the oldest of the three points expires. When you share or paste content or articles from another website, you must include the URL/link back to where you found it, who wrote it, and what website it's from. Said content will be removed if this doesn't happen. We cannot tolerate illegal videos on Pacers Digest. This means do not share any links to them, do not mention any websites that host them or link to them, do not describe how to find them in any way, and do not ask about them. Posts doing anything of the sort will be removed, the offenders will be contacted privately, and if the problem becomes habitual, you will be suspended, and if it still persists, you will probably be banned. The legal means of watching or listening to NBA games are NBA League Pass Broadband (for US, or for International; both cost money) and NBA Audio League Pass (which is free). Look for them on NBA.com. Provocative statements in a signature, or as an avatar, or as the 'tagline' beneath a poster's username (where it says 'Member' or 'Administrator' by default, if it is not altered) are an unwanted distraction that will more than likely be removed on sight. There can be shades of gray to this, but in general this could be something political or religious that is likely going to provoke or upset people, or otherwise something that is mean-spirited at the expense of a poster, a group of people, or a population. It may or may not go without saying, but this goes for threads and posts as well, particularly when it's not made on the off-topic board (Market Square). We do make exceptions if we feel the content is both innocuous and unlikely to cause social problems on the forum (such as wishing someone a Merry Christmas or a Happy Easter), and we also also make exceptions if such topics come up with regards to a sports figure (such as the Lance Stephenson situation bringing up discussions of domestic abuse and the law, or when Jason Collins came out as gay and how that lead to some discussion about gay rights). However, once the discussion seems to be more/mostly about the political issues instead of the sports figure or his specific situation, the thread is usually closed. We prefer self-restraint and/or modesty when making jokes or off topic comments in a sports discussion thread. They can be fun, but sometimes they derail or distract from a topic, and we don't want to see that happen. If we feel it is a problem, we will either delete or move those posts from the thread. Generally speaking, we try to be a "PG-13" rated board, and we don't want to see sexual content or similarly suggestive content. Vulgarity is a more muddled issue, though again we prefer things to lean more towards "PG-13" than "R". If we feel things have gone too far, we will step in. We like small signatures, not big signatures. The bigger the signature, the more likely it is an annoying or distracting signature. Do not advertise anything without talking about it with the administrators first. This includes advertising with your signature, with your avatar, through private messaging, and/or by making a thread or post. The difference between your picks for each team and their real score is added together. That is your "off by". Lowest wins. You pick Pacers 90 Knicks 80. The real score is Knicks 95 Pacers 81. You are off by 24. (90-81) + (95-80). RoboDoug is a computer program. He can only understand your guesses if they are in a certain format. See the FAQ for details. Points are awarded for 1st place (9), 2nd place (6), and 3rd place (3). 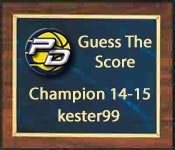 Bonus points are awarded for predicting the correct winner (1) and guessing exactly right (10). Total points at the end of the season wins the contest for the year, earning you the admiration of your peers. Preseason points do not count toward your season total. This thread will be closed to further guesses at approximately 10 minutes before game time. We're changing the identity of our basketball team -- dramatically. We're a power post team -- a blood-and-guts, old-school, smash-mouth team that plays with size, strength, speed and athleticism. We attack the basket. . . . This is the new identity of our team. It was a great effort. I'm very proud of our guys." The light, not the lie. [~]) ... Cheers! Go Pacers! Myles Turner during Vic's postgame interview: "Tell you what the East is in trouble now boy"
All times are GMT-5. This page was generated at 12:38 AM.